This is lumber in a raw form. It hasn't been cut into any particular dimension yet. It's like a blank canvas for you to create your art with. Therefore a stack of lumber contains all kinds of widths (generally 4" to 10") and lengths (generally up to 14 feet). Picture above shows our domestic lumber selection - widths & lengths are random. Sized as random widths and lengths, think of hardwood lumber as a raw material rather than a fixed-size product. Since it's randomly sized, it costs you less money than lumber that's sawn and trimmed to particular sizes. Since what you're making is probably a custom project anyway, if you were to buy lumber that's been made to size you'll still probably need to cut and finesse your project parts to make the right size and to the right fit. Why pay for the labor and waste of fixed sized lumber if you're just going to cut it anyway? Random widths and lengths are measured by the board foot, which is a measurement of volume. 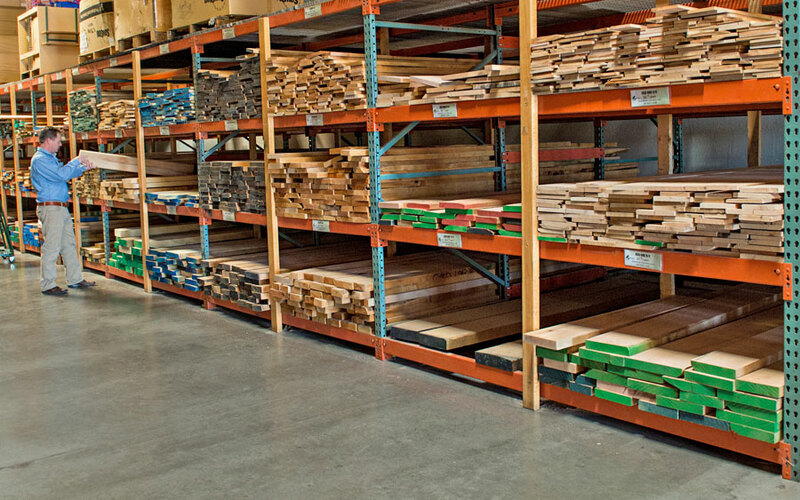 You might be used to 2x4 and 1x6 materials priced by the lineal foot. With random widths and lengths the way to measure it is by volume. So our lumber has a vast variety of sizes. Therefore it gives you more options to arrange boards for grain and color and to create the sizes you need.